The December 7, 1941 surprise attack was famously called by President Roosevelt "a date which will live in infamy" and he was forced to declare war against Japan, and then Germany, thus entering World War II. The country rallied to serve, and the home front helped the cause in a variety of ways - rationing, donating/recycling, and making needed items (ie. bandages). 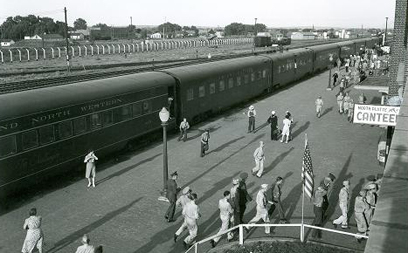 On Dec 25, 1941 was the first official meeting, but hundreds of locals had gathered days before to meet a trainload of their men (Nebraska National Guard), but it was the Kansas troops who they then gave food. Incredible. caring. unbelievable stories of sacrifice. A mother who had just learned that her son had been killed, still went in to volunteer. People not only contributed their time, but also ration stamps, supplies, produce and precious gas. While the original canteen building is no longer there, the Lincoln County Historical Museum has wonderful displays about the canteen, with the words of participants over the loudspeaker. very poignant. Coffee cups taken on-board the train would be dropped off at the next station to be returned on the next train. Anyone celebrating their birthday were given a birthday cake, and holiday food made to make the troops feel at home during the holidays.